The characters "cuatrillo" and "tresillo" were innovations of Jesuit missionaries in the XVIth century to transcribe certain sounds in Mayan languages of Guatemala that do not occur in Spanish. These are illustrated here in a sample taken from the book The Annals of the Cakchiquels, by Daniel G. Brinton. This does not seem appropriate to me, though, as it seems obvious from the name "tresillo", from the typeform shown in Brinton (above), and from the parallel situation with cuatrillo (clearly derived from "4") that the tresillo typeform is derived by reversing the typeform "3". Indeed, Robertson (in working around the typographic limitations he faced in 1984) uses the digit "3" to represent tresillo in his article. In Campbell 1977, the cuatrillo is presented more or less in its actual form, but the tresillo appears to have been reproduced by printing the letter "c" and then partially overstriking the circumflex, "". This evidence leads me to conclude that there is a current user community for cuatrillo and tresillo. For the former, I see nothing standing in the way of proposing a new character in Unicode, LATIN LETTER CUATRILLO. Recent depictions of tresillo have been quite varied, though, and I have not seen any samples from XVIth and XVIIth century usage to be confident of what the glyph should look like. Also, some may feel uncertain about a possible relationship to LATIN CAPITAL / SMALL LETTER OPEN E (particularly given Robertson's comments). Thus, I would want to see further research done before proposing a character LATIN LETTER TRESILLO for addition to Unicode. Campbell, Lyle. 1977. 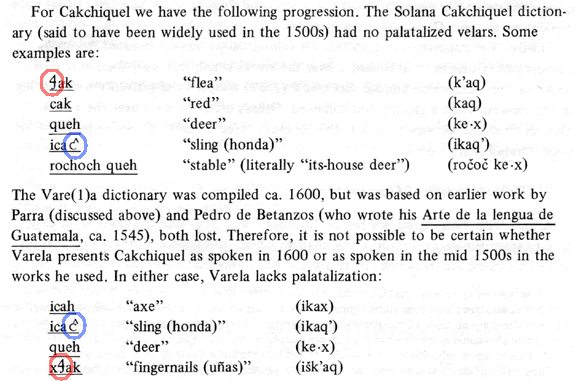 Quichean linguistic prehistory. (University of California publications in linguistics, 81.) Berkeley, CA: University of California Press. Robertson, John S. 1984. "Colonial evidence for a pre-Quiche, ergative 3sg *ru-." International Journal of American Linguistics 50.452-5. Robertson, John S. 1986. "A reconstruction and evolutionary statement of the Mayan numerals from twenty to four hundred." International Journal of American Linguistics 52.227-41. Robertson, John S. 1999. "The history of first-person singular in the Mayan languages." International Journal of American Linguistics 65.449-65.